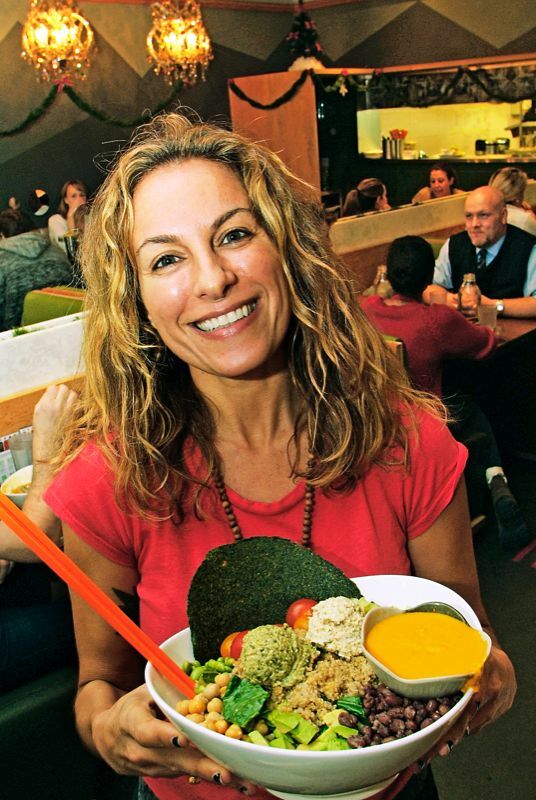 Tal has amassed a cult-like following over the past two and a half decades, with vegetarians and carnivores alike lining up for her delectable culinary creations such as fresh rice bowls, tacos and our personal fave, quinoa onion rings (if you haven’t tried them, you haven’t lived!). She has also co-authored a series of best-selling cookbooks all while expanding the Fresh brand (there are now four locations in Toronto, two in Moscow and one in Mexico City). Splitting her time between Toronto and LA, Tal is constantly on the move but still maintains a healthy lifestyle that includes daily yoga (she’s really into beginners classes these days—“I get more out of it because it’s slower, less competitive and I’m not as likely to push myself and overstretch”) along with a hit of cardio, be it cycling, hiking or a power walk. Here Tal shares her can’t-live-without items for staying healthy—and sane—while on the road. No matter where I am, I’ll have Energy Green Superfood powder right before a yoga class or any type of workout. Or if I have a really big day planned, I’ll take it in the morning. It’s like my coffee. Not a lot of people know about this product but it’s a life-changer. It has wheat grass and chlorella, and it gives you lots of energy. It’s super alkaline and rebalances the PH in your body if you ate badly the night before (or if you’re a coffee drinker, it’s a great way to cut the acidity of coffee). I use it as a pick-me-up. I’m really in love with Aesop face products; they have a lovely store on Queen Street, on the same block as Fresh on Crawford. Their products are totally natural and smell really good, too. I’ve been using a bunch of their products, like the B triple C facial gel and parsley-seed eye serum, but the hydrator is my favourite. I keep it in my bag and use it frequently I’m loving it! I have my salt-and-pepper cashmere wrap with me all the time. It’s soft, it doubles as a blanket, even a pillow. I’ll use it in a movie theatre, on my lap or around my shoulders. I got it at Zane, a great shop on Queen Street West. It felt like a pretty big purchase at the time but I’ve used it pretty much every single day since. I love green juice and *Urban Detox is my number once choice. It’s like taking a multivitamin because it has all of the essential things I need to stay well fuelled and to keep my systems in proper shape. For me, that means greens such as kale; ginger because it’s a great anti-inflammatory and it’s antibacterial, too, which I need for all the travelling I do; cayenne pepper, which is the highest botanical source of Vitamin C—even more so than oranges!—and it also promotes circulation (ideal for someone like me who’s always cold); and lemon, which is astringent and an excellent cleanser. I’m not a coffee or tea drinker, so this is my go-to. I just discovered Kindle. I used to always carry books with me and my fiancé recently gave me a Kindle and now I’m like, ‘Oh, now I get it!’ I just finished ‘Super Brain’ by Deepak Chopra. It’s rooted in science and how the brain works and it’s been fascinating. I’ve been reading Wayne Dyer’s ‘Change Your Thoughts, Change Your Life,’ which is about the power we have to change our reality when we change our perspective. It’s also about practicing kindness—especially appropriate these days. *We proudly offer Fresh cold-pressed juices for sale at Spynga. This entry was posted in healthy living, life & wellness coaching, spynga stuff and tagged cold-pressed, fresh, juice, myFood coach, technology. Bookmark the permalink.